Ona K. Benson, 87, a longtime Stewartville resident, passed away on Saturday, July 14, 2018 at Seasons Hospice in Rochester. 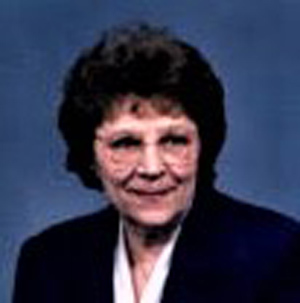 Ona Kathryn Moen was born on Oct. 21, 1930, in Crookston to Albert and Ruth (Holen) Moen. She grew up on the family farm in rural Fertile and graduated from Fertile High School in 1948. After graduation from Aakers Business School in Grand Forks, North Dakota in 1949, she was employed by the State of North Dakota and later worked in Minneapolis. On Dec. 3, 1953, she was united in marriage to Jerome S. Benson in Minneapolis. Following their marriage, they lived in various states until moving to Stewartville. Mr. Benson died in 1966. In 1967, Ona was employed as a secretary in the administration office at Stewartville High School and was the superintendent's executive secretary when she retired in 1992. She was a longtime active member of the Stewartville United Methodist Church and volunteered at the Stewartville Historical Society. Ona enjoyed gardening, quilting, reading, Norwegian food and spending time with friends and family, especially her grandkids and great-grandkids. The family wishes to thank Seasons Hospice and Root River Estates of Stewartville for the kind and compassionate care of our mother. Ona is survived by her four children, Julie (Rocky) Sheldon and Wanda (Fredrick) Rhodes, both of Rochester; Wayne (Suzanne) of Owatonna, and Davis (Diane) of Mason City, Iowa; five grandchildren, Shannon (Steven) Moore, Matthew (Jess) Sheldon, Onalee (Wayne) Finseth, Trevor Rhodes and Andrew Benson; six great-grandchildren, Samson, Sylvia, Lillian, Aurelia, Iris and Willem; two sisters, Betty (Robert) Lee of Staples, and Carol (Marshall) Guntzburger of Grand Forks, North Dakota; her good friends, Joan and Chuck Koestler, and many nieces and nephews. Ona is preceded in death by her husband, Jerome, great-granddaughter, Shelby Lynn, her parents and a sister, Avis and her husband, Loren Lindahl. The funeral service will be held at 1 p.m. on Wednesday, July 18, 2018 at the Stewartville United Methodist Church with Rev. Wane Souhrada officiating. A private family burial will be held prior to the funeral service at Woodlawn Cemetery in Stewartville. A time of visitation for family and friends will take place from 5 p.m. to 7 p.m. today (Tuesday, July 17, 2018) at Griffin-Gray Funeral Home in Stewartville, and one hour prior to services at the church on Wednesday afternoon.